Digiflavor Siren 2 is one of the best MTL GTA tank with 2ml or 4.5ml e-juice capacity. Designed for MTL vapers, Siren 2 GTA features a slim drip tip and a shorter chamber for intense flavor. Together with precise adjustable airflow control, Siren 2 is a true MTL tank. Designed for the best MTL vaping, Siren 2 GTA is an innovative single coil rebuildable tank aimed to bring optimal flavor. Digiflavor Siren 2 adopts a shorter chamber and a slim drip tip for extremely intense flavor. Together with precise adjustable airflow system and an upgraded single coil build deck which is suit for various larger coils, Siren 2 MTL GTA will bring you a fabulous vaping experience. • Designed for MTL (mouth to lung) vaping. This atomizer is supposed to be one of the easiest RTA to setup but still I haven't found the right amount of cotton to have a good drain, and not having from time to time a dry puff or burnt flavour. On the other hand it is a quite adaptable MTL as it has a lot of air configurations and on its more opened configuration it has a quite wide air flow making it a good choice if you don't know if MTL is to you and you just want to try it. Speaking about the overall quality it's acceptable without being superb, some of the parts of the ato feels like plastic but for me the worst part was the design of the screws/wire fix; in MTL it's normal to use very thin wires and these screws/fixations doesn't feel very firm with thin wire. Writing this comment full of positive emotions about this purchase. 1. Ordering is super easy. The proces is user friendly and there are no issues with ordering and payment for your desired products. 2. Delivery was super fast. I already received the product after 13 days from order date. I had ordered before from different stores but never had such a fast delivery. Tracking number worked perfecly so I could always check my purchase. 3. The product. 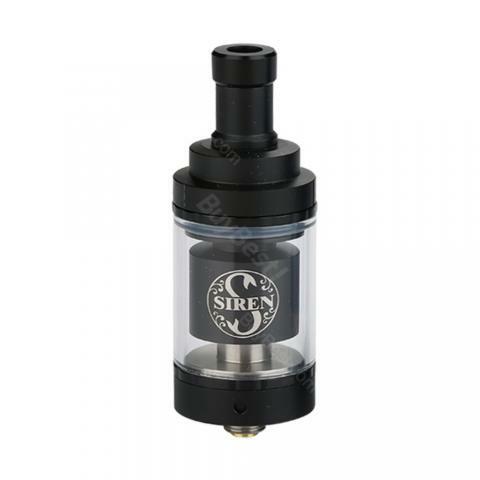 Siren 2 is one of the most popular MTL tank on the market and it realy deservs it's popularity. Digiflavor decided to go with a very easy-to-build two-post style deck with a single coil. The screws on the posts are flathead screws. The slots for the wire are at an equal height, so when you build a coil, make sure that your legs are on the same level. The airflow comes from straight under the coil, lined up with the build. That, along with the proximity of the drip-tip to the deck, creates optimal flavor. The vapor doesn’t need to travel far to get to your mouth. The wicking slots are well milled and there are no sharp edges. The Siren has something every MTL vaper appreciates: fully customizable airflow! This airflow control gave me everything I’ve ever wanted. There are five different-sized airflow holes that you can open or close however you want, since there are no click stops. There’s also a single hole next to the airflow slide that lets you open the holes individually — or even just half a hole, if you prefer. The top cap is a twist and pop, as opposed to an unscrew and the fill slots are easy to use with almost any ejuice bottle. I had no issues at all with the juice flow; it wicked perfectly. There was no spit back, no gurgling, and no leaking, no matter what I did with the tank. The flavor is very good, as is the vapor production. You won’t blow huge clouds, but that’s not what a MTL vape is for. Overall, I can recomand this tank to every MTL lover. It is definitely the best MTL on the market for this price. Great! Seller did everything as I requested, and even put a gift, set spirals!!))) very satisfied, strongly recommend and goods and seller! Just super! The seller did everything as I requested, and also put a gift, A set of spirals!!))) Very satisfied, I strongly recommend both the product and the seller! Shipping in SF for almost a month, price 1850 rubles, tank standards, spiral came as a gift. Tight adjustable tightening. A week will add a review. Not dripka :)) Constructive simple, but reliable. You can buy. Excellent MTL tank. This is my favorite device. I have had a good experience with Siren 2. It has all good features I expected. That's a fantastic mouth to lung tank. Digiflavor has done a good job. It delivers extremely great flavor, no leaks. Restriced airflow, awesome flavor and the coil build is so easy. A good choice for mtl vapers. High quality, full adjustable airflow and good price.